Since their introduction to the market, the Harley-Davidson Sportster line of motorcycles has proven its worth, as a line of high-performance bikes, earning praise as racing motorcycles, land speed racers, track racers and best hill climbers. The Sportster models have always stood out with their impressive performance stats, as well as their stunning appearance and affordable price. These motorcycles are powered by a four-stroke engine, in which the connecting rods share a crack pin. During the course of an intriguing 60 years long history, this line of motorcycles has changed, adjusted, improved, and become one of the most influential motorcycle lines ever launched. The Harley-Davidson Sportster line was first introduced in 1957, alongside with a new engine, the OHV pushrod 883 cc air cooled engine, which impressed the public with its performance to such an extent, that these motorcycle models, labeled “XL”, replaced all other models in the Harley-Davidson family by next year. These types of engines, which also improved over the years and were in fact overhead-valve Ironhead engines, were a vital part of the Harley-Davidson Sportster up until 1986, when they were replaced by the improved, Evolution engine. In 1958, the company added new models to the revolutionary XL Sportster motorcycles, namely, the XLC model, which was excellent for racing, the off-road XLCH model and XLH model, all of which featured a higher compression ratio. By next year, the XLH model was improved through the addition of high lift intake cams, which marked only the beginning of constant upgrading on the part of the Harley-Davidson Sportster motorcycle line. In the next decade, production soared in comparison to the first few years, reaching a new high of 4500 units in 1967, a number which was beyond impressive for the 60s. The year 1970. was especially successful and important, as it was the year the new, improved XR750 model was introduced and the Sportster models officially gained the title of the motorcycle line with the most units produced in a year. In 1972, the standard 900 cc engine was replaced with the enhanced 1000 cc engine, while the gear-shift on the bikes was switched from the right side to the left in 1975. The later years of the decade were marked by the introduction of the XLRC model which catered to those who value comfort, with its padded seat and handlebars, as well as to those who value speed, with its larger tank and taller gear ratios. In 1979, the Sportster models became the smallest bikes produced by Harley-Davidson, after their other bikes, similar in displacement, were withdrawn from production. The 80s marked the end of the Ironhead engine, after a outstanding run of 28 years. As a worthy replacement, the Evolution engine was introduced in 1986, and it featured either the improved 883 cc capacity or a new, enhanced 1100 cc capacity, both of which ensured high engine performance. The 1100 cc option proved to be so popular, that it was increased to 1200 cc two years later, which was also the year the butterfly carburetor was replaced with the constant velocity unit, which was considered more modern. The 90s were perhaps the decade in which the Harley-Davidson Sportster line was subjected to the highest number of improvements, which included the addition of a 5-speed transmission unit, the improvement of the oil tank and the inclusion of the electric speedo. Probably the most important change to the Sportster 883 models, was the addition of the belt drive in 1993, which replaced the chain drive and has since become an integral part of the Harley-Davidson brand. The first two decades of the 21. century were extremely important for this line of motorcycles, and the most important years were 2004 and 2014. Overall, the bikes gained a technological upgrade, which included the upgrade of the engine and internal transmission, in the year 2000. 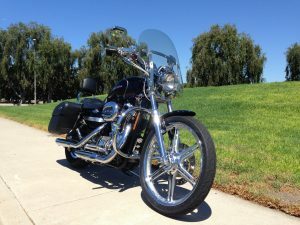 In 2004, the standard frame of these motorcycle models was completely redesigned, with a new hamcan, a new, superior oil tank, and a mounting system especially designed to reduce vibration. In 2007, the XR1200 model was introduced, as a new, updated version of the XR750 model, only with a revolutionary fuel injection system. The year 2014. marked the introduction of a completely electrical system, as well as the inclusion of larger brakes, increased engine compression ratio and optional ABS. Two of the most recent additions to this motorcycle line, are the Harley-Davidson Sportster 1200 Custom, which is an excellent cruiser bike, and the Harley-Davidson Sportster Iron 883, which is part cruiser, part retro sport bike. The Harley-Davidson Sportster line is less expensive that other similar motorcycles, while its light weight ensures easier maneuvering, especially at lower speeds. The gas millage is satisfactory and slightly better than in similar models, the handling is surefooted, while the brakes are quite sensitive. Also an important advantage of the Sportster models is the comfortable experience it provides, owing to its medium-height handlebars which are comfortably bent and its gentle powerbands. Some vibration can occur during higher speeds, but the rubber mounting system included in the models designed after 2004, reduces these problems. Also, different Sportster models cater to different needs, so the 1200 model is more reliable when carrying a passenger, than the 883 model. For some people, depending on their height, the seat may be too high, but this problem can easily be fixed by replacing the high seat with a lower profile seat. All in all, the Harley-Davidson Sportster makes for an excellent choice for a motorcycle, one which caters to many different needs, depending on the model in question. Why choose the Harley-Davidson Sportster? The pros listed, all point out that the specs of these motorcycles make them an excellent choice for a starter bike. On the other hand, apart from being an excellent choice for beginners, these bikes offer an excellent performance to more experienced bikers, with their traditional motorcycle values, which make them an exquisite choice for day-to-day transportation and back-road rides. The customization options available make the Harley-Davidson Sportster a truly versatile line, while its agility and light weight provide for a enjoyable riding experience, suitable for a range of potential bikers.